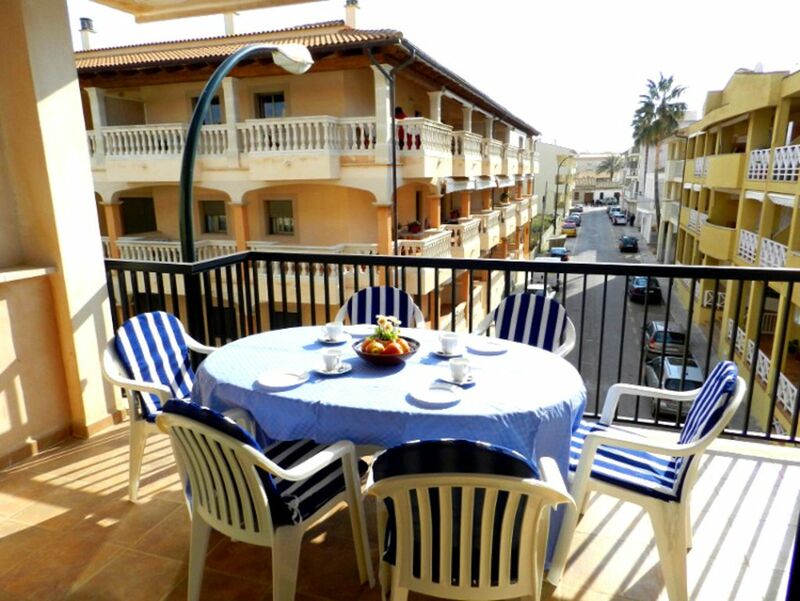 This apartment is located on the ground floor of the apartment building and has 3 terraces. A furnished terrace with afternoon sun, a small economy terrace which can be reached via the kitchen and furnished indoor terrace that leads away from one of the bedrooms and in summer offers pleasant shade and coolness. The apartment has 3 bedrooms, 1 bathroom and 1 bath, living room, integrated kitchen. Equipment: dishwasher, washing machine, Internet, satellite TV and air conditioning in the living room and all bedrooms. These 3 spacious, comfortable apartments are located on the ground floor (apartment Marina 0) in the 1st. Floor (apartment Marina 1) and in the 2. Floor (apartment Cala Galiota 2) in an apartment house in the center of Colonia St. Jordi, very close to the harbor with its two beaches. This apartment has 3 bedrooms, 1 shower room and 1 bathroom, living room, integrated kitchen, utility room with washing machine and terrace with afternoon sun Marina 1 and Marina 0. Cala Galiota 2 has morning sun. The equipment includes washing machine, dishwasher, Internet, satellite TV and air conditioning in the living room and all bedrooms. The location of the apartments is very central: supermarket, bakery, bars, restaurants are no more than 3 minutes walk away. A car is not necessary. Free parking on the street outside the house. Car rental: Concomitant car rental reservation through our car rental car Colonia, you get 10% discount on car rental. Please can submit a quote! Care: The care of the tourists carried out by the German mediator and the Mallorcan owners. The Beaches: The village of Colonia is situated between the beautiful undeveloped natural beaches Es Trenc It Dolc. The Es Trenc stretches from Colonia miles up to Sa Rapita. In the off season you can take demanding walks on the beach with little trips into the hinterland. There is a bird sanctuary and the famous saline landscape. In summer, especially the beach fun. You can rent chairs at the beach or take one or the other to be. Between the village of Ses Covetes and Sa Rapita a part of the beach is designated as a nudist beach. The beach It Dolc, from its basic sources of fresh water to gush, is located about 500 m from the harbor. It is usually not so frequented as the port directly on the beach promenade and offers scenic views of the port of Colonia and the anchor in the bay boats. Starting from this beach walks out to more remote secluded beaches to the lighthouse of Ses Salines. Sehr schöne Wohnung in zentraler Lage. Zum Meer, zur Promenade und zum Supermarkt sind es nicht mehr als 150m. Die Wohnung ist sehr sauber und gut ausgestattet. Die Vermieter sind sehr freundlich, hilfsbereit und bei Fragen jederzeit erreichbar. Wir haben uns sehr wohl gefühlt und einen schönen Urlaub in Colonia Sant Jordi verbracht. Und hat es sehr gut gefallen mitten in der Stadt zu wohnen! Klar es gibt Straßenlärm und das nicht zu knapp, aber es gibt ja Ohrstöpsel! Das Einzige was uns gefehlt hat waren Liegen auf der Terrasse! Und die spanischen Nachbarn, mit den Katzen müssten deren WC häufiger, oder überhaupt säubern! Das roch etwas auf der kleinen Innenhof Terrasse! EL APARTAMENTO ESTA MUY BIEN UBICADO, CERCA DEL PUERTO Y CALA GALIOTA. LA ESTANCIA HA SIDO MUY AGRADABLE, LA ATENCION PRESTADA POR LA AGENCIA MUY BUENA Y EL APARTAMENTO ES MUY ESPACIOSO, COMODO Y LIMPIO. Das Apartment liegt ziemlich perfekt zentral: 1 Minute zu Fuß zum Supermarkt, 1 Min. zum tollen Obst- und Gemüse-Laden, 1 Min. zur Autovermietung, 3 Minuten zum Hafen, Promenade und kleiner Strand und ca. 15 Gehminuten (mit 2 kleinen Kindern) zu einem sehr schönen Sandstrand der nicht voll war und sehr flach rein geht. Wir wohnten im Erdgeschoss und hatten eine sehr schöne Terrasse abseits der Straße mit Abendsonne. Man muss sagen dass 2 der 3 Schlafzimmer und das Wohnzimmer zur Straße raus gehen, die oft laut sein kann. Aber das wird wahrscheinlich normal sein, weil man findet selten was ohne Straßenlärm. Die Wohnung ist ordentlich eingerichtet und sauber. Die Vermieterin ist sehr nett. Wem gelegentlicher Straßenlärm nichts aus macht, dem kann ich die Wohnung sehr empfehlen! Colonia Sant Jordi is a charming little fishing village between the two natural beaches'S Avall 'and' Es Trenc 'location, which is wonderful because of its clear waters and white sand also called the Caribbean of the Mediterranean. The village offers all the comfort of the tourists needed and it was also his family-friendly and tranquil character, for it has been known for decades, received. The island of Cabrera, with its interesting history and its flora and fauna typical of the island is the Colonia upstream and can be visited in the summer with the excursion boat. Colonia offers especially pleasure beach in the summer. In spring and autumn hikers and bikers get their money and the winter offers relaxation to those who seek above all peace, admire the Almond Blossom, the island covers in February with a white-pink blossoms snow. For the children there are several playgrounds. Likewise, one can discover the hidden corners of Colonia in an approximately 1stündigen ride on the small tourist train which runs during the summer months. For rainy days, a visit to the aquarium offers in which you can admire the flora and fauna of the Natural Park of Cabrera. Die Touristensteuer ist nicht im Preis enthalten. Bei gleichzeitiger Buchung eines Mietwagens über unsere Autovermietung Autoscolonia erhalten Sie 10 % Rabatt auf die Automiete. Bitte lassen Sie sich ein unverbindliches Angebot unterbreiten. Ein Taxi vom Flughafen zum Ferienobjekt kann gleichfalls über die Agentur gebucht werden.